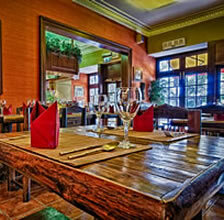 Thai Lemongrass is an award winning and one of the longest standing Thai restaurants in Edinburgh. The name itself evokes images of tropical nights at a beachside restaurant in Koh Samui, sipping cocktails after a sumptuous Thai meal under the stars. As you enter through the doors and are shown to your table, it feels a million miles away from the world outside. The resident Head Chef, who has been with the restaurant since it opened in 2002, ensures that the dishes are authentic and delicious. Genuine Thai food, welcoming service and ambience almost whisk you away to a distant land.The restaurant occupies an excellent location in Bruntsfield directly overlooking the Meadows and has ample parking nearby. It is also on several major bus routes into the city centre or a brisk 20-minute walk from the Royal Mile. All in all, an excellent venue to meet family and friends for a terrific Thai meal.